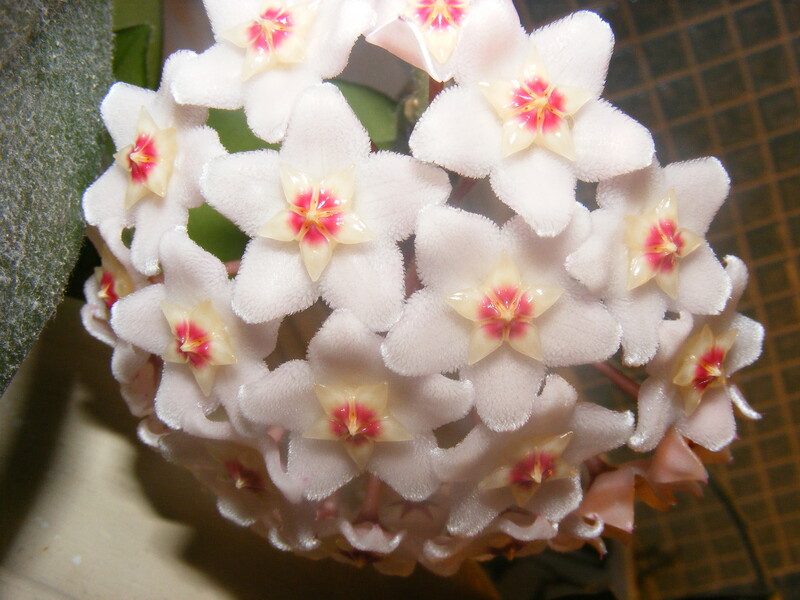 My mom’s hoya has finally bloomed. I went into the bathroom last night and I could smell the perfume from the open buds. I always find the scent to be the strongest at night. If you look closely you can see the velvety texture of the flower petals. I love how the flower looks like a little star burst. Here is some information about the hoya. Like I had mentioned earlier it is a finicky plant and doesn’t like big pots or to have its roots spread out. Also it takes years for it to finally bloom. The flowers appear in axillaryumbellate clusters at the apex of 2-3 cm peduncles, with repeated clusters of flowers developing sequentially on each peduncle. The flowering peduncles get 2-3 mm longer with each flowering, and can eventually reach 7 cm or more long; the base of the peduncle is smooth, with growth subsequent to the first flowering of the peduncle is rough with numerous tiny bracts. Each flower is about 1 cm diameter, with five thick, waxy, triangular petals; colours range from white to pink or yellow. They are sweetly scented and produce abundant nectar. I love my mom’s plant and I know she did a cutting for me too, I think I get one of the flowering plants. My cousin has one in his greenhouse and my mom said it just blooms like crazy, I should get there to take a picture of that. This entry was posted in A lot to do about nothing and tagged flowers, Hoya. Bookmark the permalink.